The breeding sites are within a tiny area in the downstream sections of streams where they enter the Barron River and the total distribution occurs within an area of less than 3 sq. kilometres. The distribution occurs around the township of Kuranda [link to specific map], in the mountains about 18 km north-west of Cairns. Extremely high water quality is required by these rainforest frogs for breeding. Water quality can be improved by rainforest canopy shading, by eliminating stream bank erosion as the sediment will collect in the breeding riffles and destroy the algae which tadpoles rely upon for food before metamorphosis. The total adult population of the Kuranda Frog has been estimated at < 1000 individuals and may well be considerably less than this, particularly given population declines over the last decade. One of these populations is relatively large (in the hundreds of individuals) whereas the rest are small (< 50 individuals). It is possible that frog populations will decline associated with regional threats such as urbanisation and road development. 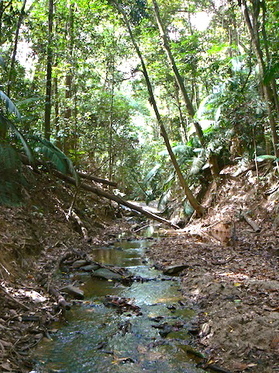 A typical small permanent creek in the Myola area. Usually with clean and clear water, these areas are under threat from land development.